Given how polarized American politics and society are these days, it’s easy to think of Democrats and Republicans, liberals and conservatives, as entrenched and embittered enemies locked in endless battle. 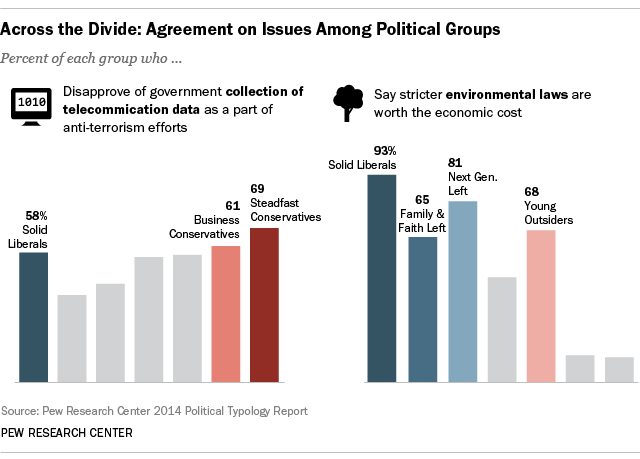 But sometimes politics does indeed make strange bedfellows, and data from the Pew Research Center’s latest political typology report show some surprising areas of agreement between otherwise opposing groups. Take, for example, the question of whether the U.S. government should collect telecommunications data as part of its anti-terrorism efforts. Opposition to such practices is highest at both ends of the political spectrum: 69% of Steadfast Conservatives, 61% of Business Conservatives and 58% of Solid Liberals say they disapprove of government data collection. When it comes to immigration, Steadfast Conservatives and Hard-Pressed Skeptics — two groups which otherwise have little in common — share similarly negative views: 79% of the Hard-Pressed group and 73% of the Steadfast group call immigrants a burden on American society, while 81% of Steadfasts and 72% of the Hard-Pressed say newcomers threaten “traditional American customs and values.” Those two groups also express the most support for a national effort to deport all illegal immigrants: 42% of Steadfasts and 31% of the Hard-Pressed favor such a policy. On several hot-button issues, the Faith and Family Left more resembles the two conservative groupings than their usual allies on the left. For example, 54% of the Faith and Family Left say abortion should be illegal in all or most cases; the only other groups with majorities saying that were Business Conservatives (59%) and Steadfast Conservatives (70%). By almost identical percentages, the same three groups were the only ones with majorities opposing the legalization of marijuana. The Faith and Family Left also joined with the conservative groups in saying that military force was the best way to defeat global terrorism. When it comes to race and discrimination, though, it’s the Next Generation Left that looks more like the right-leaning groups. Two-thirds (67%) of Next-Gens say the U.S. has made sufficient changes to give blacks equal rights with whites, aligning them with Business Conservatives (83%), Steadfast Conservatives (81%) and Young Outsiders (70%). Next-Gens also are the Democratic-oriented group least likely (19%) to say racial discrimination is the main thing holding back black people. Conversely, about two-thirds (68%) of the GOP-leaning Young Outsiders say stricter environmental laws and regulations are worth the economic cost, putting them in the same camp as Solid Liberals (93%), the Next Generation Left (81%) and the Faith and Family Left (65%). There are, we suppose, two ways to look at all this ideological cross-pollination, depending on whether you’re a glass-half-full or glass-half-empty sort of person. You can see it as evidence that there are areas where groups could work together across partisan lines to resolve seemingly intractable issues, or that both parties’ coalitions are so internally fractured that finding workable solutions to those issues is well-nigh impossible.